referring to the format of an issue. e.g. CD, LP, Cassette, etc. referring to the type of performance. e.g. master, alternate, incomplete, etc. referring to the type of session. e.g. studio, live concert, radio, etc. The entries in these popup menus can be customized by the Brian user. Entries can be added, deleted and modified. Also the order as they appear in the popup menu can be changed. In the case of the Format popup, this order will also effect the order issues are displayed in reports. To customize these popup menus, select the Set Popups item in the Edit menu. This will display a window as shown below. In this case, the Format entries are displayed. Displaying the Take and Session popup entries can be done by selecting from the popup menu above the list of entries. To add a new popup, press the New button. 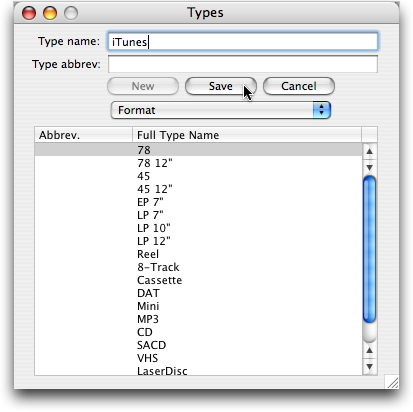 Then type the new entry into the Type Name field as shown and press Save. 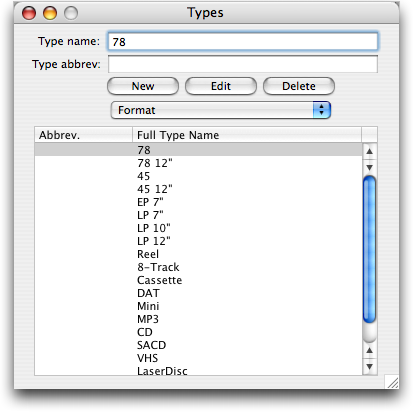 In the case of formats, the Type Abbrev. field is not used so there is no need to type an abbreviation. 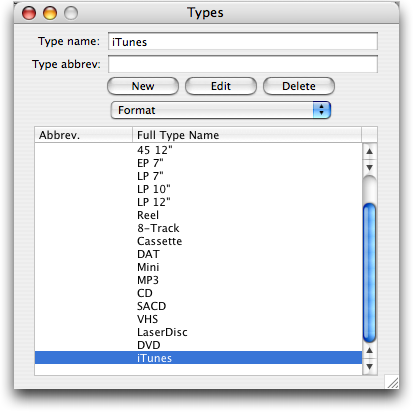 The new entry for iTunes will show up at the bottom of the list of formats. 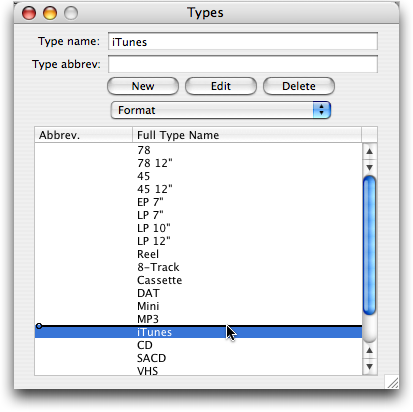 To change the position of the iTunes entry, simply drag the entry to the desired position as shown below.